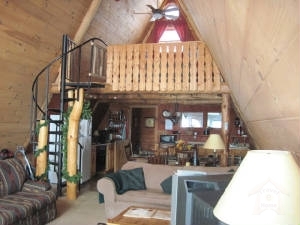 Breathtaking lake views abound from our beautiful three-level cabin/chalet. It is cozy, comfortable and comes completely furnished for everything you might need for your vacation. PINE TREE has a sleeping loft with a king-size bed. On the lower level there is a bedroom with two (2) twin beds. View of the lake from Pine Tree Lodge. Doors open onto a large deck where you can watch the sun set over the lake. Large open living area is complete with stereo, TV/VCR/DVD and a well-stocked library of books and movies (or bring your own). Enjoy dinner on the deck (gas and charcoal grills & picnic table provided) or in our fully-equipped kitchen.